The overall physical, mental, spiritual and social development and rehabilitation including employment training of those human beings who are mentally destitute or discarded by society or deprived of family life. To rehabilitate wandering mentally challenged women and organize, manage, administer and provide shelter, food and clothes for such people as mentioned in the vision so that through loving care and medication, they may regain. 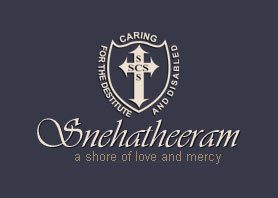 Snehatheeram was seed down in the heart of Rev Sr. Roselin, by God with a definite plan, in the month of September 2002; she opened this home of mercy on 26th September with three mentally challenged women picked up from the streets. The divine seed in Sr. Roselin found a fertile ground in a heart inclined to love unreservedly. Inspired by her divine spouse, she decided to give herself fully than to receive, to love than to be loved, to serve than to be served. A resolute and confident personality emerged from within her with total trust in the divine providence. God in his mysterious way led her to the hitherto little known Vilakudy village in Pathanapuram taluk of Kollam district in God’s own country, Kerala.